Are you looking for a cheaper alternative to the PMD Microderm System? How about the Appolus AP6212? But before you make a purchase, here’s a review that highlights what previous buyers say about their unit. 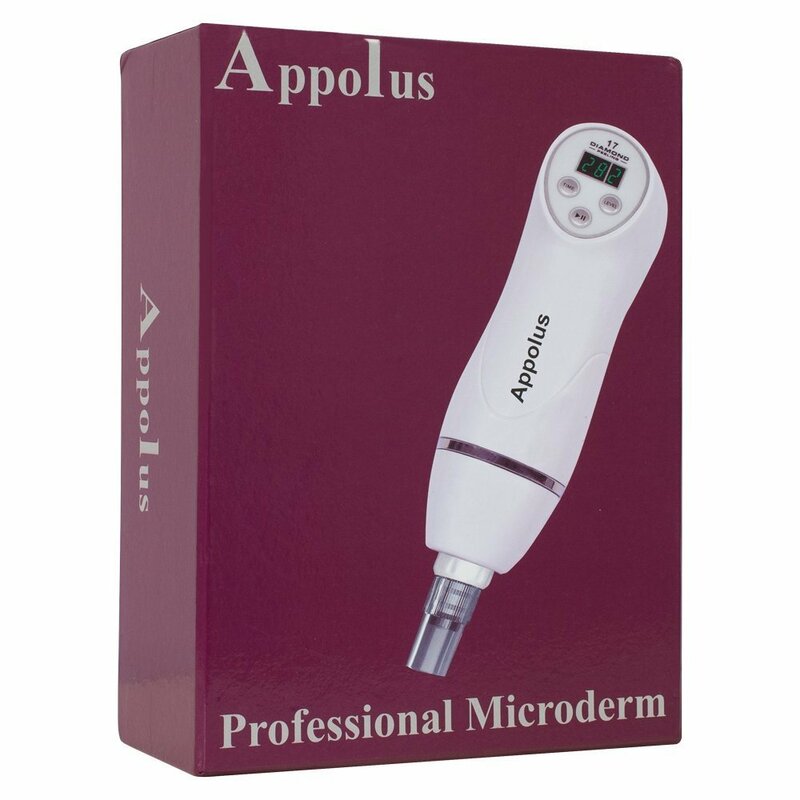 It’s advertised as a “microdermabrasion machine,” but unlike the Kendal HB-SF02, the Appolus is a hand-held beauty tool. As a microderm device, it also promises to buff away dead skin cells to reveal a more youthful glow, reducing fine lines and blemishes. It also has tips and suction heads that you can choose from depending on what parts of the face (or body) you’d like to target. Is it any good? Find out what our recommendation is in this Appolus microdermabrasion machine review. Here’s a list of the Appolus AP6212’s key features. The Appolus AP6212 uses the power of vacuum suction and exfoliation to activate cell turnover, increase circulation, and scrub away dead skin cells. It does this through the tips and heads included in the package. 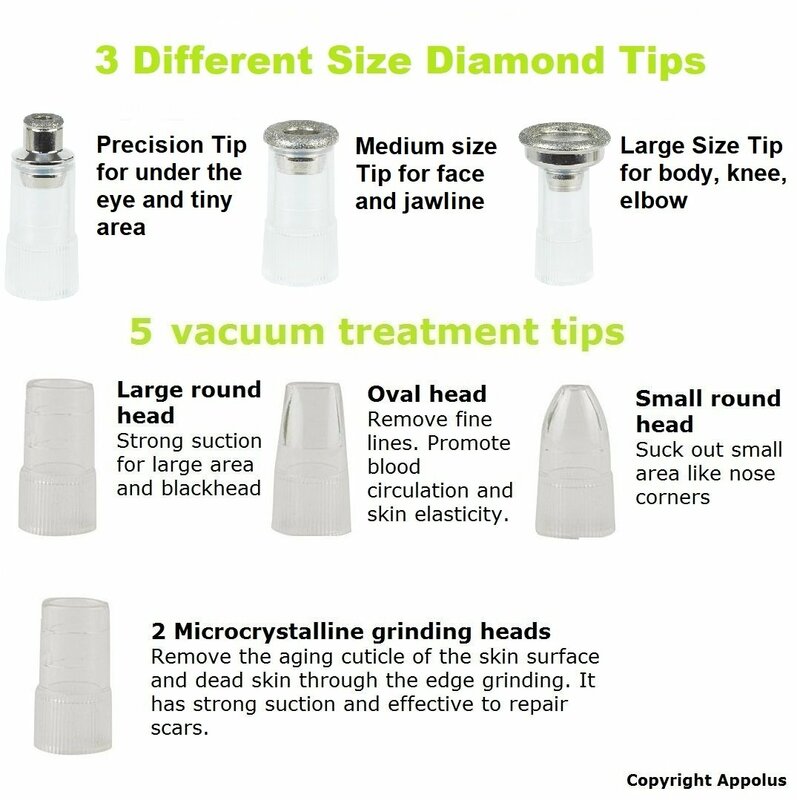 Choose from 3 diamond tips and 5 vacuum heads. These attachments come in a variety of sizes, with each size ideal for a particular part of your face and body. For instance, the “precision diamond tip,” the smallest, should be used under the eyes. The “small round suction head” is for nose corners. What is the suction power of the Appolus AP6212? As advertised, it has 3 suction levels, and at the highest setting, it can go up to 17.5 inHg. What are the expected benefits of using this 1 to 2 times a week? One, it helps remove blackheads and whiteheads. Fine lines and wrinkles are reduced. Pores are also reduced. According to the brand, it should take at least 3 months before you see noticeable results. Also read: PMD Personal Microderm System Review – Worth It? In this section of our Appolus microdermabrasion machine review, we give you a summary of what previous buyers have said about this handheld beauty tool. The sellers say that the Appolus “works well for acne scars.” Does it really? One person agrees. She says that with regular use, she has noticed a “huge difference” in the texture and coloration of her skin, especially her acne scars. The Appolus AP6212 is effective in fading out newer scars. Older scars, even if they don’t completely disappear, should at least flatten. Another person who says has acne due to stress noticed that this microdermabrasion tool helps clear up her face up to 70%, which is more than what she gets at a spa where she spends more than what this machine costs. Apparently, this machine also works for stretch marks, as observed by one person. She says her stretch marks are “fading” after several uses. Several users also have positive things to say about this product when it comes to dark spots and blemishes. While not everyone agrees that the Appolus AP6212 has a strong and powerful suction, several users have attested that it works in removing blackheads and whiteheads. The Appolus AP6212 does what it says it does. It helps reduce acne scars, clear up acne, remove blemishes, and make your skin smoother and softer. But remember, these results won’t happen overnight. It takes consistency and several weeks (or even months) to see a noticeable difference.